How would you like to be able to select your best shots from your smartphone and produce immediate prints, wherever you are? Well, nowadays, you can easily do it using a mobile, battery run printer that supports Bluetooth, or with one that supports Wi-Fi as long as your location has Wi-Fi connectivity. Some of these mobile printers come with some neat features, such as the ability to print photos, not just from your smartphone's hard disk, but also from your social media accounts such as Facebook, and the ability, using the App associated with the mobile printer, to edit the shots before printing, choose special templates and apply filters. But, the best thing about these printers is that they do not require any ink to produce beautiful colorful pictures! No more worrying about messy ink cartridges and ribbons! ​Finally, these printers are usually equipped with a microUSB port for easy charging from your laptop computer, or by connecting to a wall outlet using a microUSB adapter. 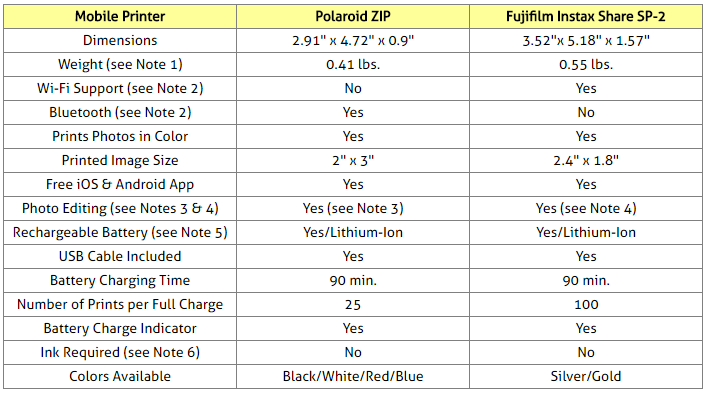 This article will compare Polaroid ZIP and Fujifilm Instax Share SP-2 mobile printers. These were not just the most popular among Amazon customers at the time this article was written, but they had also received mostly good reviews from most Amazon buyers (an average of at least 4 stars each out of 5 stars!). Note that Polaroid ZIP printer has a built-in battery, while the battery of the Fujifilm Instax Share is removable. The weight of the Fujifilm Instax Share shown in the table does not include the removable battery weight. Bluetooth technology is useful when transferring information between two or more devices that are near each other and when speed is not an issue. The maximum distance it can support is about 30 feet (about 10 meters). On the other hand, Wi-Fi enables a faster connection, better security, and much longer distance. The maximum distance it can support is about 300 feet (about 100 meters). So, with Bluetooth you must keep the printer very close to the smartphone it will be synced to. On the other hand, with Wi-Fi, you could keep your printer in the bedroom while the smartphone can be in the living room as long as they are both connected to your home’s Wi-Fi. And if your router has access to internet, you could access your printer from anywhere. Note that Polaroid ZIP also supports NFC (Near-Field Communication ) which is a communication protocol that enables two electronic devices to communicate by bringing them within 1.6-inch of each other. You can also do collage by creating multiple tiles and add to the image password protected text and audio messages. The batteries of both printers can be charged using the provided microUSB cable. Both batteries take about 90 minutes to charge. Polaroid ZIP prints your photos onto ZINK photo paper, which, when subjected to heat from the printer, activates unique color-forming molecules embedded in the paper’s layers. Loading the paper is very easy and fast. The resulting prints feature deep, vibrant colors and are completely smudge-proof. To get you started, ten pieces of ZINK paper are included with the printer. More paper can be purchased on Amazon (see below Amazon products section). Fujifilm Instax Share SP-2 uses Fuji Instax instant film. When you "print" the image, you're basically exposing the Instax film in the printer to the image. Once the print is ejected from the printer, it develops the image on its own over a few minutes. The Instax system develops colors by delivering the light to pigments and producing chemical reactions. It reduces the deterioration of color and sharpness caused by aging. The film comes in cartridges; each cartridge holds ten sheets. The printer purchase does not include any film; you will need to purchase them separately. The Twin Pack with 20 sheets (10 sheets each pack) is a pretty good deal (see below Amazon products section). So which of the two mobile printers is best for you? The two mobile printers considered here are high quality products as shown by the average rating each had received from Amazon customers. Indeed, at the time of this writing, they had each received at least 4 stars (out of 5 stars). There is a good chance that you would be quite happy with either printer. Both printers are small enough to take along with you in your handbag or briefcase wherever you go. They are both powered by long-lasting rechargeable Lithium-Ion batteries. They are both equipped with a microUSB port for easy charging from your laptop computer, or alternately using a microUSB adapter, by connecting to a wall outlet. Neither requires ink for printing. They both allow extensive editing of the photos before printing. With Polaroid ZIP, you can print from anywhere as long as the printer is not more than about 30 ft. away from your smartphone. But if your printer is at home, and you are driving in the country taking pictures, you will have to wait until you get home before you can print them. 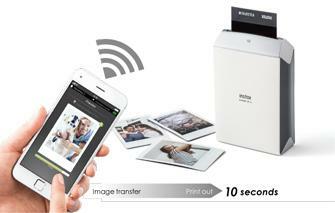 With Fujifilm Instax Share SP-2, you have to be in a location that supports Wi-Fi before you can print. So, if you are sitting in café, library or in a park, you can only print if that location supports Wi-Fi. On the other hand, if your printer is at home while you are driving in the country taking pictures, you can print remotely as long as both your home and your current location support Wi-Fi. Another difference is that with a full charge, Polaroid ZIP prints about 25 photos, while Fujifilm Instax Share SP-2 can print about 100. But all things considered, both products are lightweight, user-friendly, low-noise printers that can quickly make great-looking high quality prints! Please click the mobile printer of your choice below for price information or to purchase.